Saddle Fit is one of the most important considerations for any rider, anywhere. The purpose of the saddle is to distribute the weight of the rider evenly, provide a stable base, and to allow the horse to move independently from the rider. If a saddle is the wrong size, positioned incorrectly or defective, it can cause pain and even lameness. 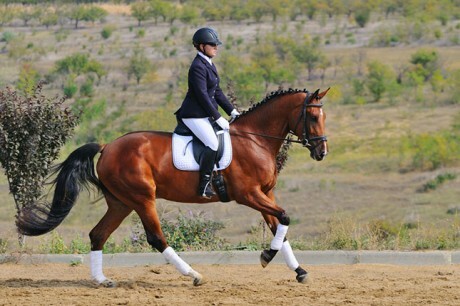 Signs of a poor-fitting saddle include head tossing, sores on the back, abnormal head carriage, difficulty changing leads, hair loss or white hairs along the withers under the saddle (indicating blood circulation being cut off), saddle avoidance or striking when saddled, bucking, swelling after removing the saddle and uneven sweat patterns. Over time, the horse’s efforts to compensate in an effort to maintain mobility and balance can result in muscle strain, pain, stumbling, abnormal gait patterns and even lameness! Poor saddle fit can result from improper placement, broken or worn trees, uneven panels and incorrect size of saddle to rider. When saddling your horse, here are some things to consider: First, place the saddle on the horse’s back without padding, put it forward on the withers and then slide it back to where it sits ‘at home’. Saddle should be fit with nothing underneath initially, then rechecked with the padding you’ll be using. There should be a 3-finger clearance between the pommel of the saddle and the withers. Points of the tree should be 2 inches behind the shoulder blade. Run you hand under the panels. Be sure there’s room under the stirrup bars to slide your hand. Check for ‘bridging’ or ‘rocking’, and be sure the saddle is level. Ensure a 3-finger space for gullet clearance. The weightbearing part of the saddle should not extend beyond the last rib. Re-check all systems with the padding on, and remember that good padding is essential. Additionally, know that multiple pads act to functionally narrow the tree, so use one good pad. These are only some of the variables involved in proper saddle fit, but they should get you started. Remember that saddle fit is not stable and not static. You need a rider in motion to accurately and comprehensively assess for proper saddle fit. Have questions? Recommendations? Post a comment, and join the conversation!